The Absolute Beginners approach is designed to make learning to sing easier than ever before! Suitable for both male and female beginners, this step-by-step guide takes you through the basics, from how to stand and breathe correctly, to singing your first song. 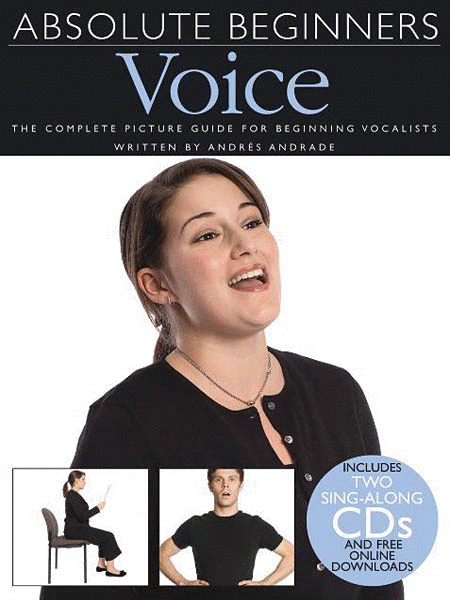 Includes a picture guide to learning the art of singing. Begins with diagrams of the head and chest, and explanations of different 'resonators' and 'articulators' that create speech and singing, followed by posture, breathing and relaxation exercises. Next comes vocal exercises - demonstrated for female and male singers on the first CD, followed by a backing tracks. Includes ten songs which are presented on the second audio CD in performance and accompaniment versions. Also includes a section on vocal troubleshooting and a pull-out chart detailing a five-week plan of vocal exercises.